The Department of Hawaiian Home Lands is the ONLY state agency guaranteed sufficient state funding for operations in the Hawai’i State Constitution. Yet, DHHL continues to use its trust resources to pay for state salaries and expenses, 37 years after the constitution was amended to make DHHL funding mandatory. Here’s an overview of DHHL’s fight and the lawsuit that brought the history of insufficient state funding of the DHHL from Hawaiian Homes Commission Chair Jobie Masagatani. What is the Nelson case about? In 2007, six native Hawaiian beneficiaries of the Hawaiian Homes Commission Act, filed suit against the State of Hawai‘i for failing to sufficiently fund the Department of Hawaiian Home Lands as mandated by article XII, section 1 of the Hawaii Constitution. Plaintiffs also sued the DHHL, the Hawaiian Homes Commission and its commissioners, in their official capacities, for breaching fiduciary duties owed to Plaintiffs for failing to seek from the legislature all funding the State is constitutionally required to provide to the DHHL. The six plaintiffs are Richard “Dickie” Nelson III, Keli‘i “Skippy” Ioane, Sherilyn Adams, Kaliko Chun, James Akiona, and Charles Aipia. Why is this case important to the Department of Hawaiian Home Lands? Because the State has not provided sufficient funds to the DHHL as mandated by the Hawai’i State Constitution. The DHHL continues to use its trust funds to pay for state salaries and expenses, 37 years after the constitution was amended to prevent this. Before the 1978 Constitutional Convention, the Hawai‘i State Legislature had the discretion to fund the DHHL. ConCon delegates concerned with DHHL depending on revenues from general leasing of Hawaiian home lands to cover operating costs proposed an amendment guaranteeing sufficient state funding for some functions of DHHL. Does the state guarantee sufficient funds to all state agencies? No, the DHHL is the only state agency that has a guarantee – a constitutional mandate requiring the legislature provide “sufficient” funds for four purposes, including administrative and operating expenses. What exactly does the constitution say about funding DHHL? Why is this important to beneficiaries? Because trust funds should be used for the benefit of the beneficiaries of the trust and not administrative and operating expenses. By using trust funds, the department depletes a source of funding that could be used to build infrastructure for new homesteads, loans or providing services to homesteaders already on the land like rehabilitation projects. If general funds pay for DHHL operations, then every dollar earned from general leases and other revenue can be used to serve beneficiaries and their ‘ohana. If the DHHL receives the $28 million, how will that money be used? The $28 million will be used to fill staff vacancies and associated expenses like salaries and wages and associated fringe benefits. The funds will also support other operational expenses such as lease payments, supplies, materials, equipment, building expenses, utilities, etc. Since 1978, the legislature has not appropriated enough general funds to pay for DHHL’s administrative and operating expense. One of the negative effects of this funding shortfall over time has caused critical positions to sit vacant. How did the Nelson case end? The case is ongoing. The case worked its way through the court system, and in May 2012, the Hawaii Supreme Court ruled the state is required to provide DHHL with sufficient funding to cover administrative and operating expenses, but did not specify how much would be sufficient. In November 2015, First Circuit Court Judge Jeanette Castagnetti ruled, “The legislature has failed to appropriate sufficient sums to the Department of Hawaiian Home Lands for its administrative and operating budget in violation of its constitutional duty to do so.” As a result, the Court ordered the State fulfill its constitutional kuleana by appropriating more than $28 million in general funds to DHHL in fiscal year 2015-16 for its administrative and operating budget. In January 2016, the state Attorney General’s office appealed the First Circuit Court decision, further delaying funds from flowing to the DHHL and its beneficiaries. 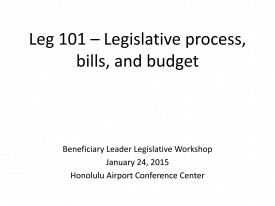 Ideally, the legislature upholds the constitution and appropriates more than $28 million deemed sufficient by the courts to the DHHL to cover administrative and operational expenses. 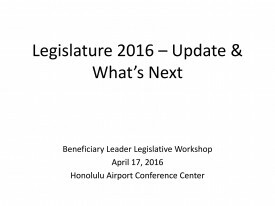 Here’s an update on the latest developments at the Hawaiʻi State Legislature regarding bills and/or issues related to the Department of Hawaiian Home Lands and the beneficiaries we serve. 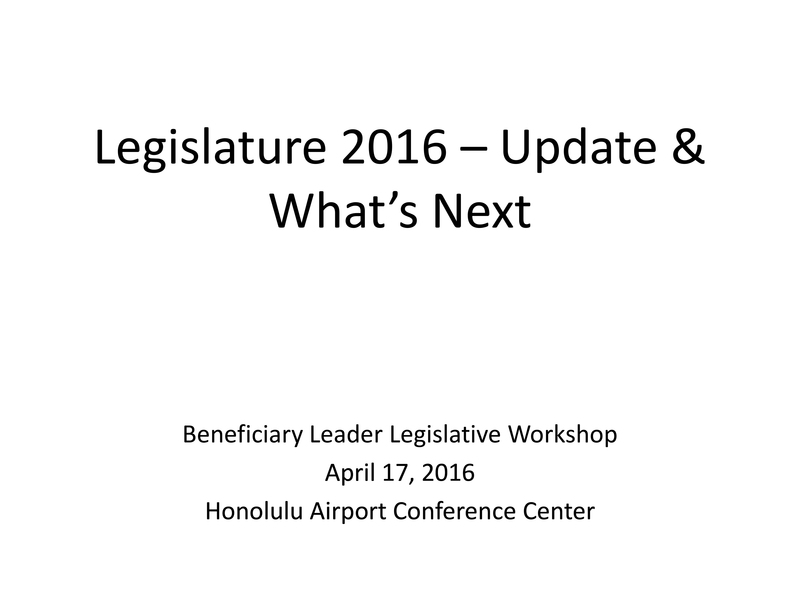 This presentation was given at the Beneficiary Leaders Workshop in Honolulu on April 17, 2016, by Lehua Kinilau. Click here to download the PDF version of this presentation. 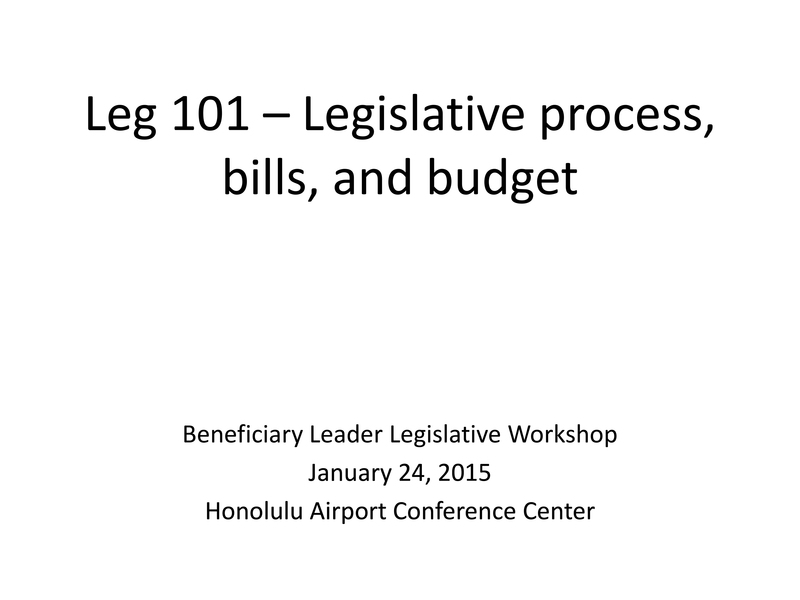 on you need to know about the legislature, beginning with a “Legislative 101” presentation by Lehua Kinilau. Click here to download a PDF of this presentation. The Legislature needs to hear from YOU! Urge your legislators to uphold the constitution and sufficiently fund DHHL with more than $28 million for operating and administrative expenses. Find your legislators and contact them TODAY!